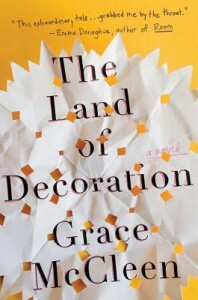 The anxiety of death and dying pervades Grace McCleen’s debut novel The Land of Decoration, and it’s a seemingly strange obsession for a novel narrated by a ten-year-old girl. Judith McPherson, however, isn’t just any child; she’s one of God’s instruments, sent to spread the word and prone to speaking in platitudes. Oh yes, she also creates miracles. Judith lives with her father in an impoverished English factory town and is daily terrorized by classmates for her outspoken proclamations about the end times. Following a particularly threatening encounter with the class bully, Judith asks her father what dying is like: she envisions the death of a wood louse in her room; she wonders if time stops when we die; she imagines her classmates finding her dead body in the school bathroom. McCleen’s novel isn’t a morose reflection on life and death, nor is it an existential tract delivered by a precocious schoolgirl. To the contrary, Judith looks forward to Armageddon because believers are delivered to the promise land during all the fire, brimstone, and wonton destruction discussed in the Book of Revelations. Judith’s preoccupations with death are more about her longing for a perfect world, one that she creates in miniature on the floor of her bedroom and calls “the Land of Decoration.” When Judith discovers her unique power, through her simulacrum world, to affect miracles (her first miraculous act is to unleash eight inches of snow in October and cancel school for the day) she turns to her distracted and depressed father for help sorting through the responsibilities of her gift. When he accuses her of blasphemy she turns to God. All this occurs in the first seventy or so pages, and if I wasn’t expected to complete a book review, I would have stopped reading. Precocious children proliferate literature, and Judith wasn’t contributing anything unique. The catalyst for Judith’s first miracle — the schoolyard bully Neil Lewis — is met briefly in the second chapter and doesn’t reappear until a quarter of the way through the novel. Absent the tension brought by scenes with Neil’s physical presence, Judith’s anxieties that he’s going to kill her seem more like adolescent delusions than serious fare. Judith’s father, furthermore, doesn’t read as an independent agent; his actions and dialogue exist merely to further Judith’s story. When McCleen — who grew up in a Christian fundamentalist household — moves away from the confines of Judith’s house and the reader is finally allowed to see her in the company of others (particularly the non-believers), the novel starts to hum. Judith hears a voice and believes she’s conversing with God, and these moments bring necessary humor to the novel. God tells her: “Well, this is a busy time in heaven right now. Four horsemen are straining at the bit, there’s some winds that are very restless, and there are a lot of locusts that are getting under everyone’s feet. Oh, and some seals that have to be opened.” At God’s urging, Judith tests her power by performing two more miracles (more snow and the return of a missing cat). Then, at last, we meet Neil Lewis. The novel picks up further momentum when McCleen mirrors Judith and Neil’s conflicts with that of the children’s fathers, who stand on opposite ends of a union dispute at the town’s factory. Doug Lewis, Neil’s father, is a thug, though somewhat cartoonish. Muscular, tattooed, abusive to his wife and children, and frequently described as snarling, he attacks Judith’s father in the grocery and at the factory gates. Meanwhile, Neil attacks Judith at school. At night, Judith and her father’s home is the site for vicious and dangerous vandalism. As Judith’s attempts to punish Neil’s treachery unfurl in the explosive atmosphere of the adults’ conflict, the story achieves depth and urgency. The voice in Judith’s head expands its prowess, taunting her with her child’s mistakes and tugging at the threads of her faith. Though Judith still addresses the voice as God’s, we see how the Devil assumes a clever disguise that takes advantage of her Christian faith. When the platitudes and parables fall away and the action unfolds with increasing speed, The Land of Decoration is engrossing. Judith’s father finally takes shape and becomes quite a different man: a more complex and more deeply disturbed man than originally conceived. Even Neil Lewis’s cruel antics receive a smattering of empathy, and Judith — who initially seemed a wide-eyed doll spouting philosophy on faith — is colored a few shades darker. At one point, my marginalia read “like Stephen King’s Carrie” and, at another, “Linda Blair.”The references are a compliment. The darker Judith’s psyche becomes and the more her imagination unleashes cruelty disguised as good deeds, the more complex her character is and the stronger the novel. “Forgive them, for they know not what they do” gives way to the Old Testament “an eye for an eye,” and the devastating consequences of such beliefs. The novel is divided into five “books” and the last one, “The End of the World,” is true to Judith. The end of one world is the beginning of another, and Judith makes a wise choice. Unfortunately, McCleen opens and closes the novel with false notes (skip the coda; it reads like a craft lesson I would have used when I was an elementary school teacher). The drama of a little girl battling personal demons alongside her father’s adult burdens would have been enough.